When I returned to the house this afternoon after a gardening session I noticed that all seven of our chooks were huddled under the vehicle in the carport….. and had been there for some time judging by the state of the concrete floor. Allen saw this Grey Goshawk a little later and managed to get a distant photo before it flew to a less obvious perch. We are quite sure that the nervousness of our domestic egg layers was a result of the Goshawk’s presence as we have, on another occasion, observed one launch an attack on the flock, albeit unsuccessfully. When Allen called the chooks at lock-up time they ran from the house to the protection of the garden in order to reach their predator-proof accommodation without incident. Now that our ecosystem is becoming more balanced we are observing a greater variety of birds of prey. This Goshawk has been recently spotted hanging out near our new wetland system while a Brown Goshawk tends to favour roosting in more forested parts of the property. No wonder the chooks spend a lot of time cowering under the car in the carport. This entry was posted in Bird Observations and tagged Grey Goshawk. Bookmark the permalink. Always a problem (IMO)to blend an ecosystem with domestic animals. I must say in this instance my sympathies are with the chooks! Yes it can be a dilemma Mick. The chooks are the only domestic animals we keep. We have been thinking of constructing a safe ‘play area’ for the girls and only giving them a couple of hours free time when we are around in the garden with them. Yes, i understand the sympathies for “the girls” – buit I really admire the Grey Goshawk. One of my favourite birds of prey. Here it is a rainforest specialist. Your bird seems very dark (on the back and wings) to my eyes. Very handsome. I agree Denis, the Grey Goshawk is an admirable bird. 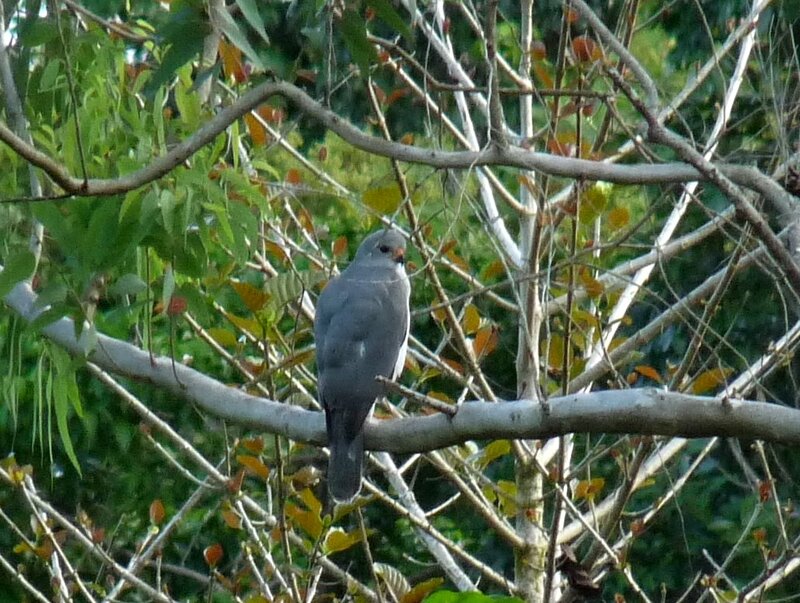 In previous years we have occasionally noted a white morph Grey Goshawk on the property but this darkish Grey bird has recently been observed roosting on our neighbour’s property. In spite of the potential danger for ‘the girls’ we are very pleased to be seeing it about. Greys often sit more openly (at some distance) than Browns in Tyto, but usually give way to Browns when challenged. Its interesting watching different species find their niche – we probably see and hear Whistling Kite most frequently.